Our educators know the importance of creating a trust filled relationship with our infants. As our educators soothe and nurture children they support them in building a sense of confidence by responding quickly and appropriately to their natural cues. Our educators comfort your baby while holding, talking, singing in a quiet reassuring voice, and by making eye contact with them. We encourage our educators to think of and research opportunities they can offer very young children, which will provoke their thinking. Because babies learn with all their senses our educators expose them to multiple sensorial experiences with materials such as paint, clay, sand, light and shadows, and much more. Children begin to point, raise hands, and make different movements and sounds to communicate as the educator asks questions connecting to the movement or to the sound. Babies love to be spoken to. Your child will begin to imitate sounds they hear and experiment with different facial expressions like smiling and frowning. As your child grows in a safe and comfortable environment they are more open to take risks and be more autonomous. Independence becomes an evident milestone for two year olds. As they discover all the things they can do they want to do more things for themselves such as eating, washing hands, dressing themselves, and learning to use the toilet. Through various sensorial, fine motor, and gross motor experiences teachers encourage children to become self-sufficient. While your child becomes more vocal and begins to put sentences together, our teachers create opportunities for conversations to help expand your child’s comprehension and literacy skills. Teachers prepare environments that encourage interactions between the children. The children exchange knowledge as they engage in conversations. The teachers ask open-ended questions to deepen children’s discussions of topics and to support the evolution of children’s theories. Teachers’ and children’s’ intentionality’s are shared with one another as a network of ideas is developed enabling both to be active participants of the learning process. While your child learns new words and fine-tunes their articulation they communicate in simple sentences, begin initiating conversations, display a desire to talk about their interests, and can relate personal experiences with others with the support of their teacher. Most children at this age express themselves in sentences and are able to recite simple rhymes and ask questions. As children’s drawings become more detailed and representational children begin to tell stories through them. This, in turn, helps them to understand that print carries a message and the words we speak can be written and read; that stories have a beginning, middle, and an end. During the year scribbles begin to appear more like symbols and letters, and children may string several of these “letters” together to form words. They become aware of the uses for writing and may dictate words for the teachers to write down. 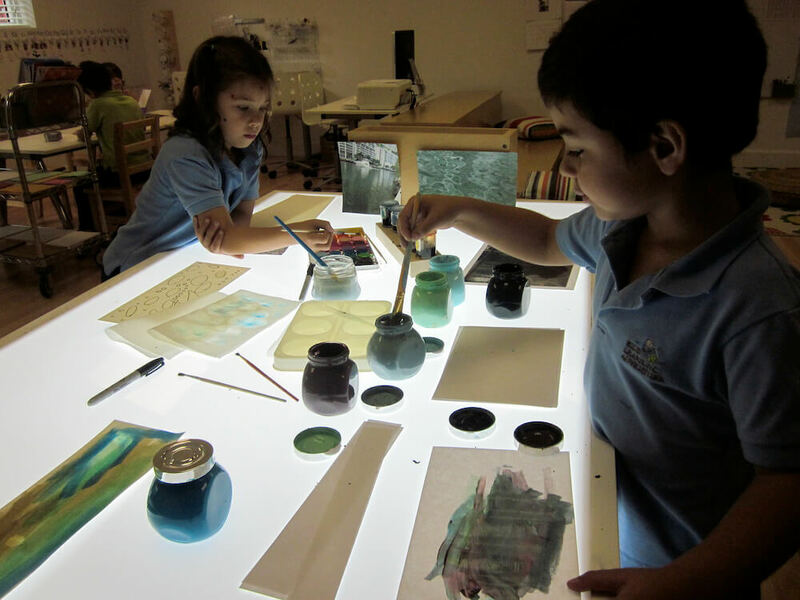 Teachers are able to support this process by setting up provocations around the spaces of the classroom that invite children to explore the world of the written code: books, notepads and writing tools, labels, maps, and more. Tracing names and numbers, categorizing shapes and the recognition of patterns are also introduced to support the development of emergent literacy skills. As children explore and develop relationships they build an understanding of what causes certain feelings and realize that others may react differently to the same situations. Because of this children begin to further progress in more complex social interactions such as joining in organized group play. As a family-oriented program, we understand the need for flexible childcare hours. We provide early drop-off where children are invited to come to school before the regular day begins to make your lives more manageable.